This incident follows a patter of armed white males attacking Black children. AFRICANGLOBE – A man who brandished a gun during an argument with a group of mostly Somali-American teenagers at a McDonald’s in Minnesota after he harassed and accused them of using welfare assistance to pay for their food has been arrested. 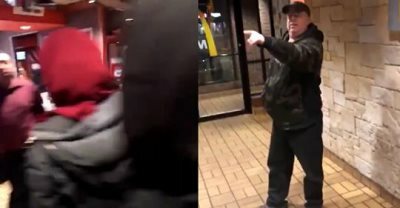 The confrontation with the man, which was partly captured on a video that has been widely circulated on Twitter, occurred on Monday at a McDonald’s restaurant in Eden Prairie, Minn., a suburb southwest of Minneapolis, and ended without any shots fired or injuries sustained. On Wednesday, the Eden Prairie police arrested Lloyd Edward Johnson, 55, under probable cause for second-degree assault, the city said in a statement. Johnson was being held at the Hennepin County Adult Detention Center. Joyce Lorenz, a spokeswoman for the city, said on Thursday that the Hennepin County attorney would decide whether to file any charges. For Jihan Abdullahi, 17, one of the teenagers in the group, the confrontation was a shocking instance of racism that left her scared but thankful that things did not turn out worse. Jihan said she and some friends were doing homework at a library on Monday when, just before 8 p.m., they decided to head to a nearby McDonald’s. Jihan said she and a friend tried to pay for an order of Cinnamon Melts with Apple Pay, the mobile payment app, but the system didn’t work. That’s when the man started to complain that he wanted them to hurry up, she said. Then, as they were passing him after leaving the line, he asked them if they were using electronic benefits transfer cards, which are like debit cards for welfare benefits, to pay for their food. Jihan said that she asked him if he had said that because she and her friends were Black, and that the man said yes. The next few moments were captured on the cellphone video. The video shows the thug pointing at the group and yelling as he backs out of the restaurant. Then the group suddenly scatters, shouting that the man has a gun. Jihan said she saw him waving a black handgun around. After the thug left the McDonald’s, the video shows, a restaurant employee used expletives to tell the teenagers to leave the restaurant, despite a bystander’s pleas not to put the teenagers in more danger. Jihan said she hoped that McDonald’s would train its workers to respond better in such situations. The encounter has raised anger at the treatment of the teenagers by both the restaurant’s employees and the man, and has been characterized as a “hate incident” by the Minnesota chapter of the Council on American-Islamic Relations. The state is home to more than 46,000 Somali-born residents and their children. Paul Ostergaard, the owner and operator of the Eden Prairie McDonald’s franchise location, said in a statement that he was taking the matter seriously. “Nothing is more important than the safety and security of our customers and employees,” he said.